Sorry I’ve been so quiet, but it’s been hard to get my head in the game this past week. For me, the time has been spent actively healing – that means walking as much as possible and napping as needed – waiting for biopsy results, and talking or corresponding with people. Which reminds me, I owe a bunch of readers of this blog thanks for your thoughts and prayers. I might as well get the news out of the way first, and tell you what little the pathologists have been able to determine so far; I still don’t have a report from them. The little thing that was dug out of my lung a week ago last Friday was, as suspected, cancer; adenocarcinoma. However, they have not been able to determine with any reliability whether it is a new lung cancer or a metastatic return of my esophageal cancer. (This would make a huge difference in terms of further treatments and prognosis.) Further tests are being done this week. So I’m still a bit distracted. Like I said, I’ve been doing a lot of walking. (One of my friends pointed out how amazing it is for someone just days out of lung surgery to be walking miles, and I have to say, now that she mentions it, I’m amazed.) A couple of days at the beginning of last week, I got out early in the day to walk in the big state park near my house. 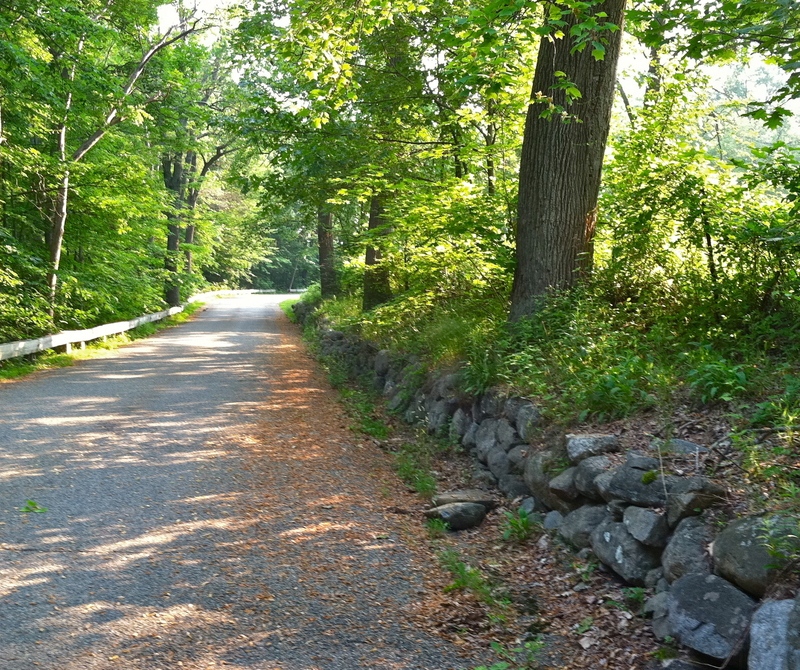 There are several miles of narrow paved roads through forests, meadows, and the official state botanical garden. There’s even an amazing manor house in the gardens that impersonates an old English manor; a gothic center section with a tree-lined circular drive, and Tudor wings added on. I couldn’t begin to count the miles I’ve walked, run, or biked there over the years. So I was walking one warm morning, and on a flat forested section, I passed a group of three older, retired guys, walking along, talking about gardening. 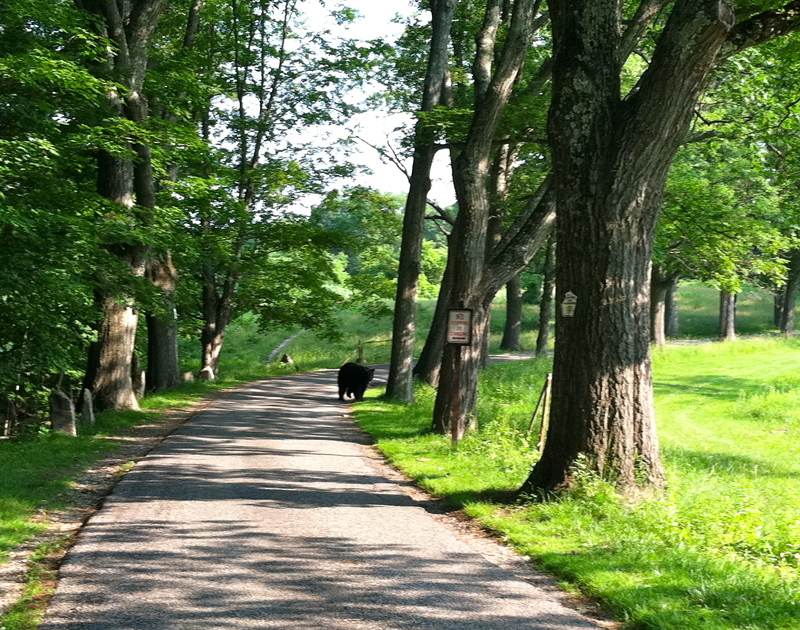 I pulled ahead of them until the road took a bend to the right and started up a hill with a meadow on the right. I don’t think I was pulling ahead of them on the hill. 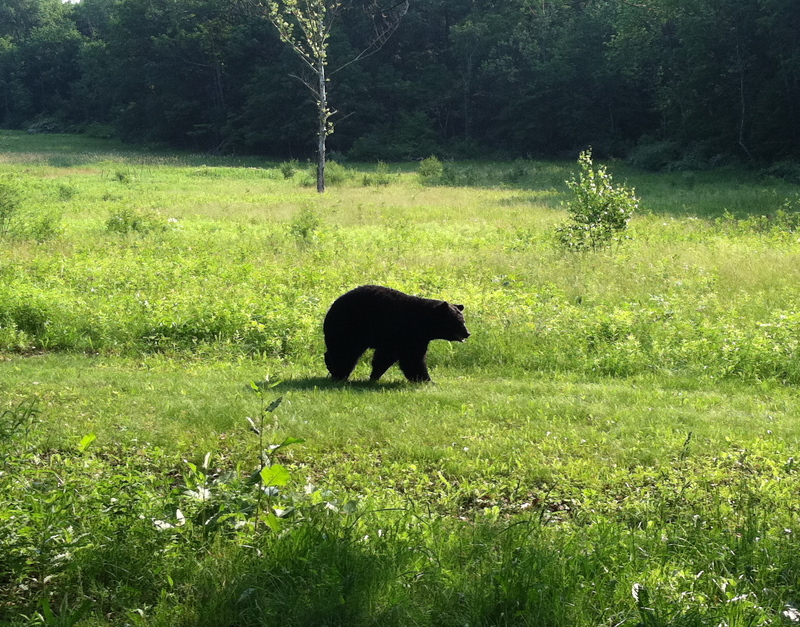 Just ahead of me, there was movement in the grass and shrubs at the edge of the meadow. A large deer poked out of the foliage at the edge of the road, and stood there, shifting and looking about nervously. I began talking to it softly and gently as I approached where it stood looking back nervously. There were little knob antlers between it’s ears; it was a young buck. I kept talking to him, with affection and admiration, and he stayed where he stood as I walked past, just in front of his nose. I warned him that the noisy garden club was coming up the road, he glanced down the hill, and disappeared into the shrubs. When I met the two women who saw the bear first, we agreed that we had just been given a gift. For my part, a leisurely encounter with an animal, especially a wild animal, always makes me feel so connected, to creation and Creator. The gift I received was the one I have needed most these waiting days, a gift of peace. This entry was posted in Cancer, Personal and tagged animals, bears, cancer, deer, esophageal cancer, love, lung cancer, nature, spirituality, walking. Bookmark the permalink. Paul, wishing you a gift of peace every day : ) You are constantly in my thoughts. Nature and the ability to see its beauty gives strength and inner peace. I felt a calm come over me as I read this and saw the pictures. I love this entry.